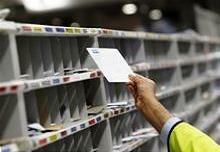 Britain’s Royal Mail said on May 17 it will pay almost 6 million pounds to incoming Chief Executive Rico Back. The payment, which will be included in the company’s annual report in the coming weeks, is to buy the new CEO out of his contract as head of Royal Mail’s European parcels division. Back is taking over from Moya Greene who will retire in September after more than eight years in charge. Meanwhile, Royal Mail warned that the decline in letter volumes may come in at the higher end of its forecast range in the coming year. Royal Mail’s shares were down 4.6 percent at 28.2 pence at 0805 GMT on May 17.